Vascular rings are relatively rare, and are frequently overlooked as a potential cause of neonatal respiratory distress in non specialized centres. This might lead to delay in diagnosis during which the child is subjected to repeated respiratory insults. Procrastination in prompt diagnosis and management can lead to significant comorbidities or even death. We highlight the case report of a preterm infant with an unrecognized double aortic arch who presented with severe respiratory morbidity and the subsequent management. Arriving at a prompt diagnosis in evaluating a neonate with severe respiratory distress is rarely achieved due to several confounding factors and a broad spectrum of differential diagnosis. Vascular rings account for 1%-2% of cases of congenital heart disease. The early recognition of vascular rings as a probable cause of neonatal respiratory distress needs a high index of clinical suspicion, and if diagnosed without undue delay, it goes a long way in reducing morbidity and mortality. Through this case report we highlight the diagnostic challenges and the subsequent management of one such patient who presented with severe morbid sequelae secondary to unrecognised vascular ring causing respiratory distress. A 4-month-old female infant weighing 2.4 kg was referred to us on mechanical ventilatory support. History revealed prematurity, treatment for aspiration pneumonia in the early neonatal period, and frequent hospital admissions elsewhere for respiratory distress. As symptoms progressed to severe respiratory distress with inspiratory stridor, it necessitated an emergency tracheostomy at a peripheral center followed by prolonged ventilation. Three weeks later, after several unsuccessful attempts at weaning from mechanical ventilation, the infant was referred to us for further evaluation and treatment. Upon arrival, the baby had substantial respiratory compromise despite the tracheostomy tube in situ. The inability to ventilate through the tracheostomy tube raised the suspicion of a tube block or a probable malposition. The infant was emergently intubated through the oral route with a 3.5 mm uncuffed endotracheal tube after sealing the stoma with adhesive opsite over a small gauze dressing. It was noted that ventilation with bilateral equal air entry could only be achieved by stabilizing the tube at 12 cm depth at the angle of mouth. Any displacement above or below this level was causing suboptimal ventilation with severe desaturation, raising the suspicion of an extrinsic compression of trachea. Other corroborative findings included respiratory acidosis with PaCO2 of 70 mmHg and hyperinflated lung fields with infiltrates suggesting air trapping on chest radiograph. High-resolution computerized tomography (CT) scan revealed a left dominant double aortic arch [Figure 1]a forming a complete vascular ring compressing the trachea just above the carina [Figure 1]b. At the time of radiological evaluation, the endotracheal tube needed to be pulled out proximal to the site of compression to clearly demarcate the site radiologically [Figure 1]c. As preliminary investigations confirmed bacterial and fungal sepsis with pneumonia, the patient was optimized with broad-spectrum antibiotics and antifungal agents before proceeding with corrective surgery. For optimal ventilation during surgery, the endotracheal tube was changed to a 3.5 mm microcuffed tube (Kimberly Clark Inc., Roswell, USA). The tube was stabilized at 12 cm from the angle of mouth to ensure that the tip was placed beyond the site of compression. A pressure-controlled volume guaranteed mode of ventilation was chosen to limit the peak airway pressures and prevent barotrauma. Although a left thoracotomy is the standard approach to vascular rings, the critical need to avoid displacement of the endotracheal tube during surgery, borderline hemodynamics, and concomitant lung pathology prompted us to favor the sternotomy approach. Once all the arch vessels were identified and looped, the right arch was divided from the dominant left arch, just proximal to the origin of the left common carotid artery [Figure 2]. After inspecting the site of tracheal narrowing externally, it was concluded that the extent of malacia might not be significant to warrant tracheal surgery. Postoperatively, the position of endotracheal tube was optimized with the help of chest X-ray. Postoperative respiratory management included lung toileting for retained secretions and lung-protective ventilation strategy with a tidal volume of 6–8 ml/kg. The infant required prolonged postoperative ventilation due to the preoperative morbidity and coexisting bacterial sepsis. Following extubation on the 8th postoperative day, nasal continuous positive airway pressure (CPAP) was electively instituted anticipating airway collapse due to tracheomalacia. This was later transitioned to high flow nasal cannula and thereafter to a regular nasal cannula for oxygen supplementation as the child tolerated weaning off CPAP without respiratory distress. The remainder of the stay was uneventful and child was discharged home on the 15th postoperative day. The infant is currently asymptomatic and is doing well on the most recent follow-up. Vascular rings are a potential cause of airway obstruction and a complete vascular ring can present in early infancy. However, there is an enormous potential for delayed diagnosis due to considerable overlap of symptoms with a respiratory tract infection or asthma. Double aortic arch is the most frequently encountered complete vascular ring where ascending aorta divides into right and left aortic arches. Right arch is situated on the posterior and left arch on the anterior aspect of the trachea, compressing the trachea by forming a complete vascular ring. Although right arch dominance is common, our case, however, had a left dominance. The most frequently encountered symptoms include inspiratory and expiratory wheezing and respiratory distress. Dysphagia as a symptom is unlikely when left arch is dominant. Backer et al. had operated on 61 patients and reported onset of symptoms during the first postnatal 6 months in 92% of their patients. Our patient suffered from respiratory distress since her birth, and she was wrongly diagnosed as lower respiratory tract infection and aspiration pneumonitis. This delayed diagnosis led to substantial prolongation of intensive care and failed weaning till the 4th month. Although echocardiography may be able to delineate the diagnosis in some cases, the diagnostic modality of choice in most centers is multidetector CT scanning. This will help to delineate the nature and severity of airway compression and the anatomy of vascular rings. A concomitant fiber-optic bronchoscopy is sometimes invaluable to define the dynamic nature of tracheal narrowing due to malacia. Repair is usually achieved through a left posterolateral thoracotomy approach, especially in those with a dominant right aortic arch. 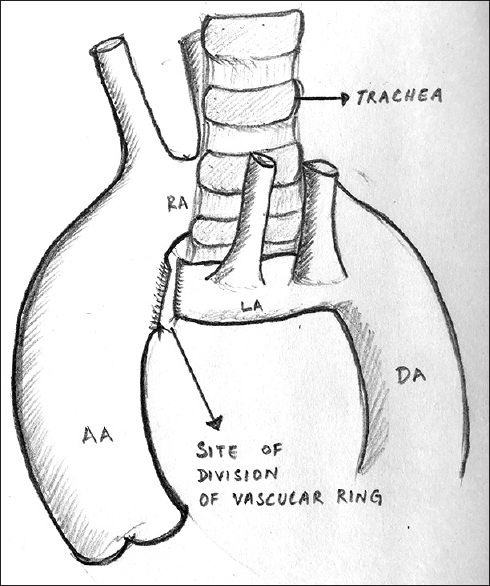 The Mayo Clinic recommends a right posterolateral thoracotomy approach in patients with left aortic arch, right-sided descending thoracic aorta, and right ductus or ligamentum arteriosum; a double arch with atresia of the right posterior segment; or when anastomosis of an aberrant right subclavian artery to the ascending aorta is performed. Repair through a median sternotomy is recommended when concomitant repair of intracardiac defects is performed. We chose the sternotomy approach keeping in mind the moribund nature of the patient and the probable need for cardiopulmonary bypass or extracorporeal membrane oxygenator. Sternotomy approach also provides excellent delineation of anatomy of the arch vessels and allows inspection of the compressed part of the trachea and bronchus to plan additional procedures such as aortopexy. Underlying tracheomalacia may lead to persistence of symptoms in some patients even after corrective surgery, but majority recover without any intervention with the growth of the infant after the relief of compression. This is true in our case as well, as the child recovered after extubation with the help of transient noninvasive ventilator support. Through our case report, we aim to emphasize the need to maintain a high index of suspicion for potential vascular anomalies in infants presenting with unexplained respiratory symptoms. Early use of diagnostic modalities such as CT can help to define an unrecognized vascular ring, facilitate early surgical correction, and minimize the respiratory morbidity in these patients. The sternotomy approach is worth considering in highly morbid patients for a safer outcome. Kouchoukos NT, Blackstone EH, Hanley FL, Kirklin; Kirklin/ Barratt-Boyes cardiac surgery: morphology, diagnostic criteria, natural history, techniques, results, and indications– Ch. 51, 4th ed., Vascular ring and sling. p. 1839. Backer CL, Mongé MC, Popescu AR, Eltayeb OM, Rastatter JC, Rigsby CK, et al. Vascular rings. Semin Pediatr Surg 2016;25:165-75. Backer CL, Ilbawi MN, Idriss FS, DeLeon SY. Vascular anomalies causing tracheoesophageal compression. Review of experience in children. J Thorac Cardiovasc Surg 1989;97:725-31. McLaren CA, Elliott MJ, Roebuck DJ. Vascular compression of the airway in children. Paediatr Respir Rev 2008;9:85-94.
van Son JA, Julsrud PR, Hagler DJ, Sim EK, Pairolero PC, Puga FJ, et al. Surgical treatment of vascular rings: The mayo clinic experience. Mayo Clin Proc 1993;68:1056-63. Fraga JC, Calkoen EE, Gabra HO, McLaren CA, Roebuck DJ, Elliott MJ, et al. 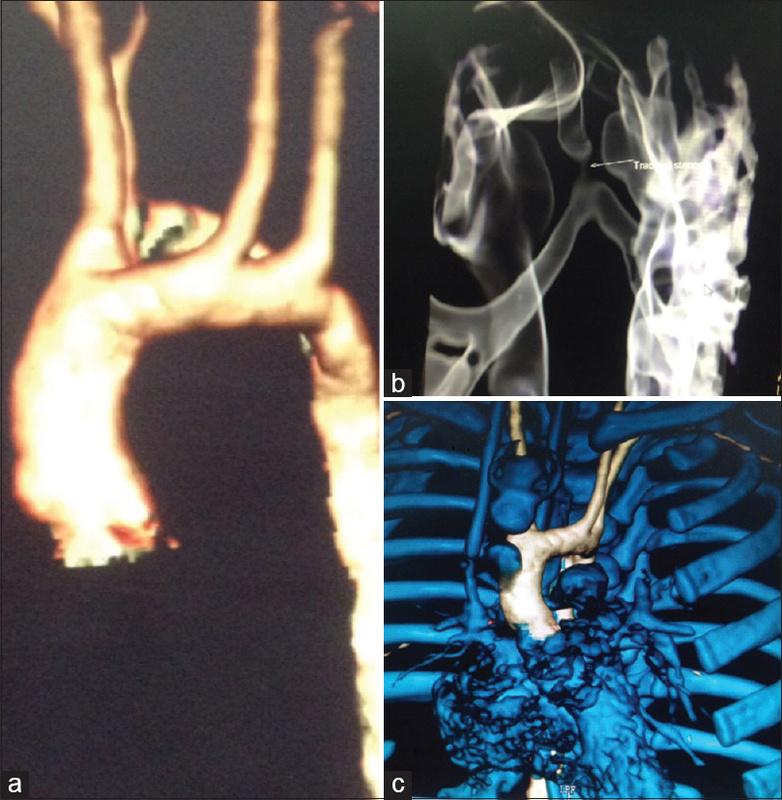 Aortopexy for persistent tracheal obstruction after double aortic arch repair. J Pediatr Surg 2009;44:1454-7.